Was part of the theater's history in the early 80's. The 2nd floor was partially occupied by Waterfront Recording Studio. Equipment included an 8 channel Lamb quadraphonic board and an Otari 5050 8 channel recorder. Bands and artist included General Kaos, The Infections, Al Weiner and the Bunz, Al Green, 5th of July. At the time there were only 2 studios in GR. Ourselves and River City, which boasted a 16 channel operation. By 1983, more than a half dozen studios sprang up with deep discounted rates, forcing Waterfront to quietly fold. 1st floor was partially occupied by the genesis of Sound Structures, Inc. They built custom PA's. The theater boasted the largest infinity wall in the area and hosted many ad agencies photo shoots. I believe that you edited the name of the projectors. Please correct this to Motiograph. These were the secondary brand to Simplex. Miotiograph projectors used an oil bath gear chain and were much more durable than Simplex. They also had a barrel shutter rather than the common fan shutter. While I was in college, I managed this former Butterfield and Johnson second run theater. It was built with about 11-1200 seats, but seats had been removed over the years to allow a cheaper city license. When I ran it toward the end of its days, it seated 800. The booth contained the original Motiongraph projectors. The arc lamps were Brenkert, which replace tho older low-voltage lamps. We even had the old Westrex disc sound equipment in the booth. Our optical sound heads were Reynolds (later Westrex) and were probably original. We found lots of old depression glass, from the dish night days down in a storage room. Our operator, Walter Pond, found a huge trove of old trailers. One night, had no film (the film truck took our film to Standish in error. Wally spliced together three hours of trailers. Our regulars were happy. I had some great kids working for me there. I would love to find some or all of them. blackhand(at)bellsouth. net. As of 10/25/11 the original sign had become structurally unsound and was taken down. Plans are in the works to make plans from the old sign and see about erecting a new version of the old sign on the building. According to the Cinema Treasures site (http://cinematreasures. 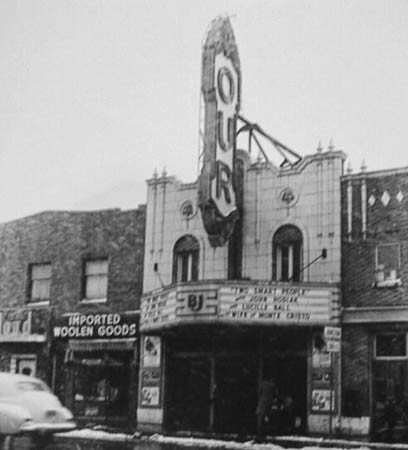 org/theater/13416/), Our Theater had a seating capacity of 1122 and closed in 1966. My late mother, Eleanor Kivinen (nee McGinnis), managed Our Theatre in the 1950s. It was there that my parents met. When the building was operating as a photo studio the auditorium floor was levelled flat to accomodate photo shoots. The projection booth is still there (all the equipment was removed long ago). There is a small patio next to the projection booth which originally served as a private viewing spot for the owners. Currently, the owners live in a refurbished apartment upstairs and the auditorium space is used for equipment demos, photo shoots and scenic construction. For more information: www. After the Our Threate closed in the Late 60s it was home for a short time in the 70s to the Grand Rapids Civic Theater(Now Located at the former Majestic Theater Site). The OUR Theatre Building hosted a nightly vaudeville act during the 1920s. It was later used as a photography studio. In 1984, John and Mary Hyatt purchased the building. With the Hyatts recent purchase of 60,000 square feet of nearby office & warehouse space, the OUR Theatre will soon be appearing in another incarnation, this time as a fully equipped film studio. This long closed theatre is now the home of John S. Hyatt and Associates, a firm that sells theatrical lighting and supplies. I wonder if the auditorium is used to show off the product line.